The road from Cairns will take you via Mareeba, Lakeland, Laura, Musgrave, Coen, Archer River, Moreton, Bramwell Junction and the Jardine River ferry to the NPA communities at the tip of Cape York. You have the choice of the rough and slow but scenic Old Telegraph Road with many challenging creek crossings along the way, a favourite of the 4WD enthusiasts; or the faster Bamaga Road which follows the higher ground to the east. Get plenty of sleep the night before-no alcohol. Don't swerve to avoid an animal on the road. This may cause you to roll your vehicle. Gently brake and slow down. Beep your horn to alert the animal. If you come across cattle and sheep on the road, stop and be patient. It's all part of the 'outback experience'. The animal might stop in the middle of the road to watch you approach. Just be patient; perhaps beep your horn and the animal will soon move on. The wet season, commonly referred to as 'The Wet', is an annual weather event occurring generally between the months of November and April. The Wet affects tropical areas in central and north Queensland. During this season, these regions can experience heavy rainfall, sometimes causing flooding and/or land slips, which can isolate communities, industries and travellers. As a result of this flooding, roads can be affected by being cut off or washed away. Roads that have been flooded must be carefully managed. To do this, road closures, load restrictions and traffic management may be implemented to protect the road asset and balance access for communities and industries. Main Roads provides regular updates to RACQ about road conditions on the network in Queensland. This information is available via the RACQ website or by phoning 1300 130 595. For more important up to date information visit Main Roads Website or BOM Website for river heights. A journey on board Sea Swift's MV Trinity Bay is definitely a voyage of discovery – a sublime voyage of discovery as you set sail in the tranquil, protected waters inside the Great Barrier Reef. 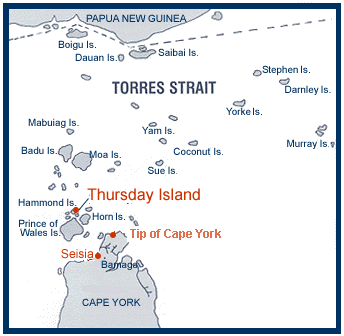 This voyage will take you from Cairns to Seisia with 3 nights onboard and the return voyage 2 nights. For more information and bookings visit Seaswift website.